Creative Repetition and Intersubjectivity looks at contemporary Freudian and post-Freudian theory through an intersubjective lens. Bruce Reis offers views on how psychoanalytic conceptions from the last century uniquely manifest in the consulting rooms of this century – how analytic technique has radically evolved through developing Freud’s original insights into dreaming, and hallucinosis; and how the presentation of today’s analysands calls for analyst’s use of themselves in unprecedented new ways. Taking up bedrock analytic concepts such as the death instinct, repetition, trauma and the place of speech and of silence, Reis brings a diversely inspired, twenty-first century analytic sensibility to his reworking of these concepts and illustrates them clinically in a process-oriented approach. Here the unconscious intersubjective relation takes on transformative power, resulting in the analyst’s experience of hybridized chimerical monsters, creative seizures, reveries and intuitions that inform clinical realities outside of verbal or conscious discourse -- where change occurs in analysis. 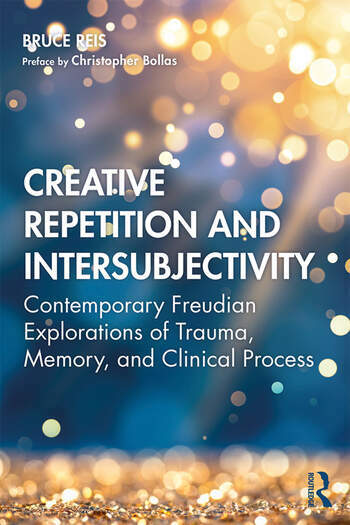 Drawing on an unusually broad selection of major international influences, Creative Repetition and Intersubjectivity will be of great interest to psychoanalysts and psychoanalytic psychotherapists across the schools of thought. Bruce Reis, Ph.D., FIPA, is a Fellow and Faculty Member at the Institute for Psychoanalytic Training and Research, New York; an Adjunct Clinical Assistant Professor in the New York University Postdoctoral Program in Psychotherapy and Psychoanalysis; and a member of the Boston Change Process Study Group. He is North American book review editor for the International Journal of Psychoanalysis and serves on the editorial boards of The Psychoanalytic Quarterly and Psychoanalytic Dialogues. He is the co-editor (with Robert Grossmark) of Heterosexual Masculinities (Routledge, 2009).